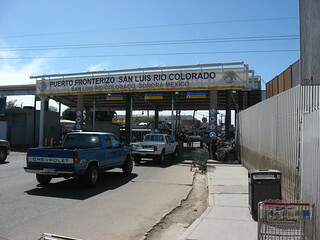 San Luis Rio Colorado can be seen only feet beyond the border checkpoint. As tempting as it was to approach the border guard and see if I could get through without a passport, it wasn't worth the hassle. Plus, I was parked in 2 hour parking a few blocks north. I'm pretty sure I could have gotten into Mexico, but I wonder how much of a hassle it would have been to get back into the United States.